Pattern for my Waffle Stitch Dishcloth. Smaller and more open than my Waffle Stitch Spa Washcloth, the holes not only give you more scrubbing power but also help the dishcloth to dry faster. Measures an ample 6” square. Once you start using these to wash dishes you will never want to use anything else! Can also be used as facial scrubbies. 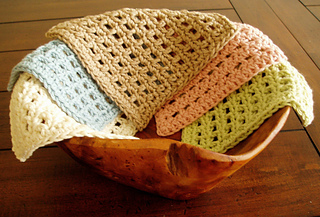 Crochet an assortment of these and pair with environmentally friendly dish soap for a unique housewarming gift. This pattern is EASY and appropriate for the BEGINNER level crocheter, assuming you have basic crochet knowledge and are familiar with standard pattern terminology and abbreviations. Please consult a crochet manual if you are unfamiliar with basic crochet patterns as I am not able to give crochet tutorials through email. You may use the pattern to make as many items as you want for personal use or to resell. If you feature a finished item made from one of my patterns on a website or blog, I would appreciate it if you would mention my name as the designer.